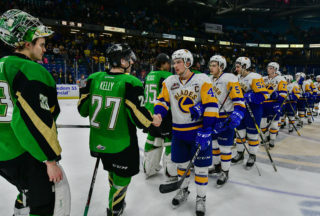 The Saskatoon Blades closed out a three game road trip while opening a season series with the Edmonton Oil Kings ending in a 3-2 victory. Saskatoon now improves to 7-8-1-0 on the season after taking two of three games on the road this week. 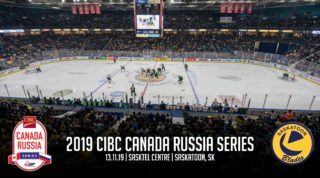 With several injuries and players out with the flu, the Blades will enjoy a week of rest before returning to action on home ice hosting the Swift Current Broncos on Friday. The power play got things going for Saskatoon, capitalizing on both chances in the opening frame. Libor Hájek blasted a one-timer off a feed from Alec Zawatsky to open the scoring 14 minutes into the contest. 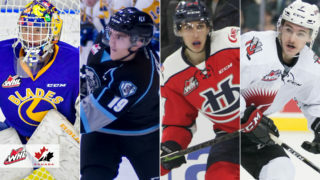 Jackson Caller picked up the secondary helper as Zawatsky’s apple was his first career point in the WHL. Minutes later the Blades went back to work on the man advantage and once again lit the lamp. 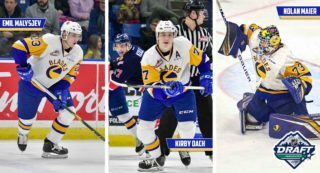 Josh Paterson shovelled in his 5th of the season; Libor Hájek and Jackson Caller added the assists to give the Blades a 2-0 lead heading into the first intermission. Hájek on the power play from makes it 1-0 Blades! In the second stanza, Edmonton upped the ante and got on the board early. Trey Fix-Wolansky cut the lead in half just 14 seconds in. The Blades started to look sluggish and ended up being outshot 15-6 in the period, but Ryan Kubic kept his club in front 2-1 after 40 minutes. An episode of deja vu– or at least that’s what it seemed like for Saskatoon– started the third period with Edmonton scoring in the first minute. Tomas Soustal tied the game 27 seconds in giving the Oil Kings and their crowd a jolt of momentum. Saskatoon had a chance to regain the lead on the only power play of the final period, but had no such luck. Instead, Cam Hebig decided to put the nail in the coffin with just 9.8 seconds left on the clock. Hebig came down the left wing and wristed a shot ricocheting off an Edmonton defender before going five-hole on Boston Bilous. That goal keeps Hebig’s goal-per-game pace with his 14th of the season in as many games. Hebig's 14th of the season with 9 seconds left to win the game for Saskatoon! Libor Hajek’s goal and assist were good enough for third star while Edmonton’s Fix-Wolansky and Soustal earned 1st and 2nd star honours. Ryan Kubic stopped 29/31 shots faced for his 7th win of the season. Jackson Caller also had 2 assists on the night for the Blades. 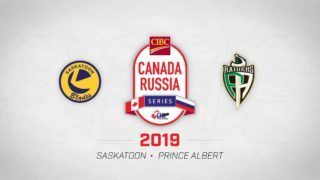 Saskatoon will now prepare for next weekend when they welcome Swift Current on Friday and travel to Brandon to wrangle the Wheat Kings on Saturday. The next Blades home game is Friday, November 10th for Salute our Veterans & Forces Night versus the Swift Current Broncos. Click here for tickets or call 306.975.8844 to book your group night or experience package!